Few things are more frustrating than the one-two punch of experiencing an unanticipated delay due to deicing procedures and then experiencing the sticker-shock when the invoice arrives a few days later. It’s that time of year when the most basic of decisions to help maintain the safety of flight come with a disproportionately large bill attached. I’ve compiled the most common member and client questions that I’ve heard from over 20-years of winter flying experience and present the answers here so you can “know before you go.” Of course, it’s our job to worry about all these details on your behalf, so ordinarily we would be applying this knowledge to serve you directly. It’s my hope you can use this information in the event you need to book a trip with a different private transportation provider. 1. Why does my aircraft need to be deiced? Virtually all aircraft designs depend on quality aerodynamics. Picture the skin of the aircraft moving through water instead of air. Each wing, every control surface attached to the wing, and anything that even looks like a wing needs to move through the water smoothly. Any interference with the smooth flow of water (air) results in a degradation of performance and a reduction in the margin of safety. Ice is also very heavy and anyone that has had to puzzle over which bag or friend to leave behind understands that every additional pound matters. More weight equals longer takeoff distances, longer stopping distances, and poor climb performance. It’s in everyone’s best interest to have an aerodynamically clean aircraft – every single time. Generally speaking, the higher performance aircraft, the more sensitive it is to any kind of snow or ice accumulation. That’s the shortest explanation for why some aircraft require de-icing when there is a simple sheen of frost on a portion of the aircraft. In all cases, deicing is a safety decision made by the Captain on-the-spot. 2. Why does my aircraft need to be deiced…. When it’s 45 degrees out and foggy? Your aircraft recently landed. The surface of the aircraft gets very cold at altitude and though the surface temperature can be quite balmy for Winter time, the plane has recently flown through visible moisture (aka clouds or fog) with temperatures at or below freezing with an airframe that has been super-cooled. This causes clear ice to form on the front of the nose, wings, and tail and often times the ice will not come off upon landing nor melt before departure time. 3. Why is deicing so expensive? Deicing fluid is Glycol. It’s a hazardous material that is not good for humans or the environment. Sometimes it’s mixed with other additives and sometimes it’s heated. The type of fluid used depends on the type of snow or ice on the aircraft, the type of precipitation falling from the sky, and the Captain’s judgment. 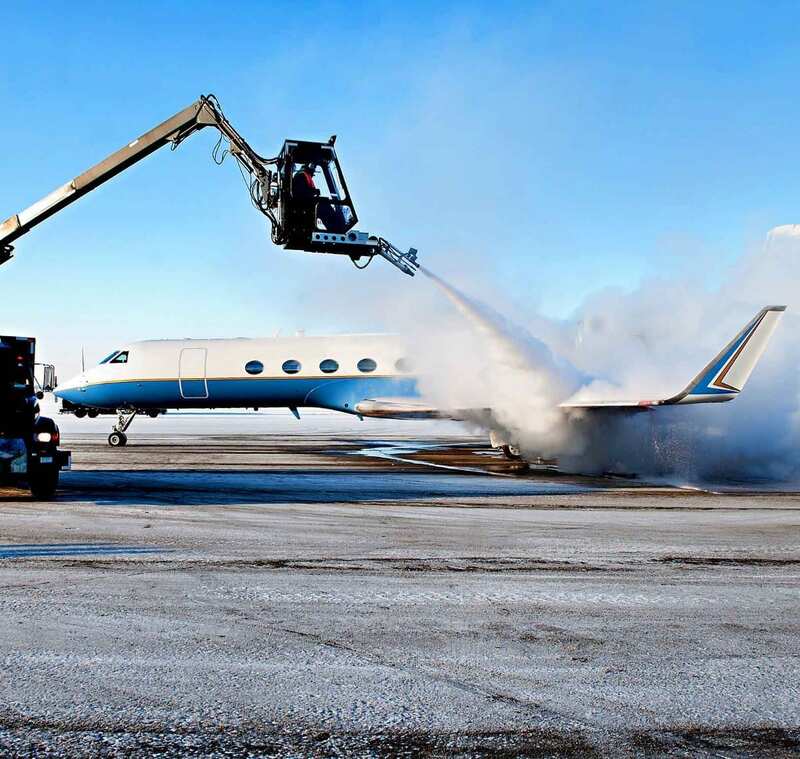 Depending on local regulations, airports must have a plan for limiting the deice fluid run-off, designating areas for deicing, or recapturing the deice fluid after its been used. Experienced and trained personnel are required to use specialized equipment to dispense the fluid properly. In short, the price per gallon is extremely expensive and even a small aircraft covered in snow and ice may require hundreds of gallons of deice fluid both before preflight and before taxi, depending on the weather. 4. Why do I need to deplane for deicing procedures? 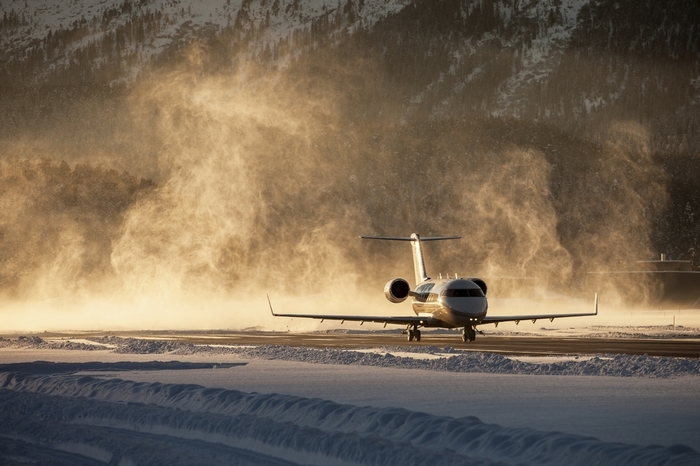 Some aircraft require that environmental systems are shut down during the deice process. This prevents the cabin air from being contaminated with glycol fumes or other additives. In some circumstances the Captain will decide that for the comfort and safety of the passengers, they must deplane for the deicing process. 5. Are the hassles associated with deicing avoidable? Absolutely. With enough care and planning, your aircraft can be placed in a hangar the night before any bad weather or even during the day while you are at your meeting. Generally speaking, the cost of putting an aircraft in a hangar is a fraction of the cost of the average deicing process. This holds true at the big, high-rent airports. A $1500 hangar bill at the major metro airport beats a major metro $9000 deicing bill every day of the week. It’s also possible in most circumstances for the aircraft to overnight at a close-by airport with better weather so that it can swoop in the morning of your trip, warm and ice-free for an on-time departure. This kind of finesse-in-planning requires a handful of prerequisites. 1) It depends on the quality and experience of the aircraft operator and crew, 2) It requires an operation that puts your needs ahead of the needs of “the scheduling department” and 3) It requires absolute excellence in communications. It would be our pleasure to take care of the prerequisites for your next trip on your behalf. Learn more about deicing by calling 877-550-JETS (5387) or get an instant quote below!